The A330 MRTT has been ordered by the Royal Australian Air Force (RAAF), Royal Air Force (RAF), Royal Saudi Air Force (RSAF), French Air Force (Armée de l'Air), United Arab Emirates Air Force, Republic of Singapore Air Force (RSAF), and others. A total of 12 nations have placed firm orders for approximately 60 aircraft, of which 33 have been delivered by the end of 2018. Universal Aerial Refueling Receptacle Slipway Installation (UARRSI) for self in-flight refuelling. The A330 MRTT has a maximum fuel capacity of 111,000 kg (245,000 lb) without the use of additional fuel tanks, which leaves space for the carriage of 45,000 kg (99,000 lb) of additional cargo. The A330 MRTT's wing has common structure with the four-engine A340-200/-300 with reinforced mounting locations and provision for fuel piping for the A340's outboard engines. The A330 MRTT's wing therefore requires little modification for use of these hardpoints for the wing refuelling pods. The A330 MRTT cabin can be modified to carry up to 380 passengers in a single class configuration, allowing a complete range of configurations from maximised troop transport to complex customisation suitable for VIP and guest missions. Available configurations include 300 passengers in a single class and 266 passengers in two classes. The A330 MRTT can also be configured to perform Medical Evacuation (Medevac) missions; up to 130 standard stretchers can be carried. The main deck cargo configuration allows carriage of standard commercial containers and pallets, military, ISO and NATO pallets (including seats) and containers, and military equipment and other large items which are loaded through a cargo door. Like the A330-200, the A330 MRTT includes two lower deck cargo compartments (forward and aft) and a bulk area capability. The cargo hold has been modified to be able to transport up to 8 military pallets in addition to civilian Unit Load Device (ULD). An optional crew rest compartment (CRC), located in the forward cabin can be installed for a spare crew to increase time available for a mission. The passenger cabin of the A330 MRTT can be provided with a set of removable airstairs to enable embarkation and disembarkation when airbridges or ground support equipment are not available. Standard commercial A330-200s are delivered from Airbus Final Assembly Line in Toulouse (France) to Airbus Military Conversion Centre in Getafe, Spain for fitting of refuelling systems and military avionics. The tanker was certified by Spanish authorities in October 2010. It was first delivered to Australia on 1 June 2011. Qantas Defence Services converted the remaining four A330-200s at its Brisbane Airport facility on behalf of EADS for the Royal Australian Air Force. On 30 September 2016, Airbus Defence and Space completed the first flight of the new standard A330 MRTT. The new standard features structural modifications, aerodynamic improvements for a 1% fuel-burn reduction, upgraded avionics computers, and enhanced military systems. The first delivery is planned for 2018. The Airbus/Saab team proposed an A330-based airborne early warning and control (AEW&C) ("AWACS") variant with Saab's Erieye radar to the UK's Ministry of Defence in 2018 for the replacement its E-3D fleet. The A330 MRTT has been ordered by Australia, France, United Kingdom, United Arab Emirates, Saudi Arabia, Singapore, South Korea and by NATO in a multi-Nation deal. Australia was the launch customer for the A330 MRTT. Designated as KC-30A, the Royal Australian Air Force (RAAF) A330 MRTTs are equipped with both an Aerial Refuelling Boom System (ARBS) and two Cobham 905E under-wing refuelling pods. The aircraft are powered by two General Electric CF6-80E engines. Australia initially arranged to procure four aircraft with an option to obtain a fifth; this option for a fifth aircraft was exercised to allow for two simultaneous deployments of two aircraft, the fifth being for contingency coverage. Australian KC-30A are operated by No. 33 Squadron RAAF based at RAAF Base Amberley. Australia's aircraft are configured for 270 passengers plus cargo. In 2005, the RAAF expected that deliveries would begin in late 2008 and be completed in 2010. Deliveries fell two years behind schedule, in part because of delays in the boom's development. On 30 May 2011, KC-30A A39-003, the third converted A330, arrived at RAAF Base Amberley and was formally handed over on 1 June 2011. The second A330 conversion, A39-002 was ferried to RAAF Amberley on 18 June 2011 and handed over to the RAAF on 22 June 2011. In June 2010, Qantas announced receipt of the fourth aircraft at its Brisbane facilities for an anticipated 10-month conversion. On 3 December 2012, the final fifth KC-30A was delivered to the RAAF. In July 2013, it was reported there were ongoing delays with preparing the KC-30A for full entry into service due to problems with the refuelling systems, including the hose-and-drogue system passing too much fuel. In August 2013, the KC-30A made its debut as a VIP transport, ferrying Prime Minister Rudd and an entourage to Al Minhad Air Base, United Arab Emirates. In August 2014, Defence Minister David Johnston announced the intention to purchase two additional KC-30As with one in VIP configuration for transport of the Prime Minister. In July 2015, Defence Minister Kevin Andrews announced the order of two additional KC-30s, to be delivered in 2018. The new tankers will be based on A330-200 airliners that were previously operated by Qantas on lease from CIT Aerospace, and will be the first KC-30As to be converted from airframes that have already seen civilian service. A formal decision to add a "modest" VIP fitout to one of the KC-30s was made in 2016. This aircraft will be fitted with seating, meeting spaces and communication facilities for VIPs, but primarily be used as a tanker. On 22 September 2014, the RAAF deployed an Air Task Group to a staging base at Al Minhad Air Base in the United Arab Emirates, as part of a coalition to combat Islamic State forces in Iraq. The aircraft included F/A-18F Super Hornets, a KC-30A tanker transport and an E-7A Wedgetail airborne early warning and control aircraft. The KC-30 started operations just days after arriving in the UAE by aerial refueling US and other coalition aircraft over Iraq. On 6 October 2014, the RAAF started their first combat missions over Iraq with two Super Hornets supported by the KC-30 tanker. In the 2016 Defence White Paper, the Australian Government stated that it was exploring options to increase the size of the fleet to nine in order to support new RAAF aircraft such as the P-8A Poseidon. In December 2016 an RAAF KC-30 conducted air-to-air refueling trials with a US Air Force B-1B bomber. Because the RAF's Voyagers are only capable of probe-and-drogue refueling, they are unable to refuel current or future RAF aircraft that are fitted solely for refueling from the flying boom, including the RC-135 Rivet Joint, C-17 Globemaster, E-7 Wedgetail and P-8 Poseidon. In April 2016, the RAF stated an interest in the idea of fitting a boom to at least some of the Voyager fleet, bringing the RAF's aircraft into line with other A330 MRTT operators around the world. Fitting a boom would not only allow operation with those types in the RAF not fitted for probe and drogue, but would also extend the flexibility of the RAF Voyager fleet in aerial refueling operations for other air forces that operate boom refueled aircraft. In 2007, the United Arab Emirates announced it had signed a memorandum of understanding with Airbus to purchase three A330 MRTT. EADS, Airbus's parent company, announced the signing of a contract with UAE in February 2008. The UAE aircraft will be equipped with both an ARBS and two Cobham 905E under-wing refuelling pods. The ARBS units installed on these tankers include a secondary boom hoist developed for the UAE. This system permits the boom to be retracted, even in the event of a primary boom retraction system failure. The United Arab Emirates Air Force selected the Rolls-Royce Trent 700 for its tankers. The first A330 MRTT for the UAE was delivered on 6 February 2013. The remaining two had been delivered by 6 August 2013. Royal Saudi Air Force A330 MRTT in special livery for the 88th National Day Celebrations. Saudi Arabia finalised an agreement to purchase three A330 MRTT equipped with both an Aerial Refuelling Boom System (ARBS) and two Cobham 905E under-wing refuelling pods, on 3 January 2008. In July 2009 it was announced that Saudi Arabia ordered three additional A330 MRTT tankers. RSAF chose the General Electric CF6-80 to power its A330 MRTTs. As of 31 August 2013 three aircraft have been delivered. On 25 February 2013 the first A330 MRTT has been placed in operational use. Three more A330 MRTTs have been ordered in a follow-on contract. Delivery is expected in late 2014. In February 2012, Singapore also expressed interest in the A330 MRTT to replace its four KC-135s. The Republic of Singapore Air Force selected the A330-200 MRTT in February 2014 over the Boeing KC-46, and signed for a delivery of six aircraft. The aircraft are to be fitted with Trent 772B engines and will be configured for a maximum capacity of 266 passengers or 37,000 kilograms (82,000 lb) of cargo, as well as a maximum fuel weight of 111,000 kilograms (245,000 lb). Deliveries are to start in 2018, with the first public appearance at the Republic of Singapore Air Force's 50th anniversary parade on 1 September 2018. The first jet arrived in Singapore on 14 August in RSAF50 livery. On 30 June 2015, South Korea selected the A330 MRTT aerial refuelling aircraft for procurement. South Korea is to order four aircraft with deliveries planned to be completed in 2019. The first aircraft was delivered on 12 November 2018 and landed in Gimhae Air Base in Busan, South Korea for its acceptance tests. The first aircraft, which was piloted by a joint Airbus and ROKAF crew, arrived in South Korea after a ferry flight from the Airbus Final Assembly Line in Getafe, Spain, with a stop in Vancouver, Canada. Designated as KC-330 Cygnus, the tankers will extend the endurance of ROKAF KF-16, F-15K, and F-35 fighters over remote areas such as Dokdo, Ieodo, and the North Pyongyang-Wonsan Line, as well as increase South Korea's ability to deploy personnel overseas for peacekeeping operations and other international support missions. South Korea received its first A330 MRTT in January 2019, and its second A330 MRTT in March 2019. In November 2011, France expressed interest in acquiring 14 A330 MRTT aircraft to replace its KC-135 tankers, A340 and A310 transports. In December 2011, France decided in principle to replace its KC-135 tankers, A340 and A310 transports with A330 MRTTs, and in October 2012 announced that they would order 14 in 2013. In 2013, Livre Blanc cut the requirement to 12 aircraft. In May 2013, Airbus made an offer for 12 to 14 A330 MRTTs to France. On 20 February 2014, French Chief of Staff identified that France would acquire 12 A330 MRTTs. These will consist of two batches, initially the standard configuration with a boom and wing refuelling pods and later with a cargo door and SATCOM. On 20 November 2014, French Air Force Minister announced an agreement to order 12 refuelling aircraft. On 15 December 2015, France has ordered eight A330 MRTTs, from an eventual requirement for 12 of the type worth a total €3 billion ($3.3 billion). The aircraft constitute the second tranche of the multi-year contract for 12 A330 MRTTs signed by the French Ministry of Defence in November 2014 and bring the total firm order to nine. The initial aircraft is expected to be delivered to the French air force in 2018, with further handovers of one or two per year until 2025. In September 2018, the Direction générale de l'armement (DGA) announced plans to speed up the delivery of the A330 MRTT Phénix, as it is known in French service, by two years, planning for the last of 12 aircraft to be delivered in 2023 rather than 2025. In addition the DGA also stated that the number would be further increased to 15 aircraft in the following years, without specifying a date for this planned order. Later in September, the French Air Force received the first A330 MRTT as per the existing timetable. On 13 December 2018, France ordered another three A330 MRTT aircraft. This is the third and final tranche of the multi-year contract for 12 A330 MRTTs Phénix aircraft powered by Rolls-Royce Trent 700 engines and equipped with the Airbus Refuelling Boom System and underwing hose-and-drogue refuelling pods. In November 2011, the European Defence Agency (EDA) Steering Board and European Defence Ministers endorsed air-to-air refuelling (AAR) as one of the initial Pooling and Sharing initiatives after having recognised the need for a greater AAR capability as it was subject to a near-constant reliance on US Air Force refuelling aircraft during the 2011 military intervention in Libya. In November 2012, The Ministers of Defence of 10 EDA member states (the Netherlands, Belgium, France, Greece, Spain, Hungary, Luxembourg, Poland, Portugal and Norway) signed a letter of intent for joint procurement of a new multi-role tanker transport aircraft. The Netherlands was designated leader of the newly launched Multinational Multi-Role Tanker Transport Fleet (MMF) project, which was launched with the declared aim of creating an initial European AAR capability by 2020. In 2013, The Netherlands, the project lead country, officially expressed interest in the A330 MRTT to replace its two KDC-10 aircraft. A study was launched on standardising the European AAR capability in cooperation with the other MFF project members. In December 2014, after having issued a request for information to the industry earlier that year, the bulk of the project member states decided to enter negotiations with Airbus Defence and Space (ADS) for the procurement of a fleet of A330 MRTT aircraft. The fleet was decided to be owned by NATO, and OCCAR and the NATO Support and Procurement Agency would support the various phases of the procurement process. This was accompanied by a request for proposals sent to ADS by OCCAR for two A330 MRTTs with options for an additional six. At this point only the Netherlands and Luxembourg were full paying members of the project, and it was decided to base these first A330 MRTTs at Eindhoven Airbase, citing that the airbase has enough noise clearance to house and operate up to eight A330 MRTTs. According to the 2015 new defence plan, the Belgian Ministry of Defence intends to buy one A330 MRTT. The Belgian government is investigating the €840 million plan of minister Steven Vandeput as well as the option of equipping the ordered Belgian A400M fleet of seven planes with under-wing pods. A combined Belgian A330 MRTT and A400M fleet would cost up to €1 billion. Belgium has expressed interest to join the tanker/transport aircraft pool with the Netherlands by likely contributing one A330 MRTT. In July 2016, the Netherlands and Luxembourg jointly ordered the first two A330 MRTT aircraft under the MMF programme, the first of which is scheduled to be delivered by 2020. In June 2017, Germany and Norway formally joined the MMF programme and have pledged to place an order for an additional five aircraft with options for an additional four. On 26 September 2017, ADS announced that they had received a firm order from OCCAR for the five additional tankers. On 19 December 2017, NATO partnered with Israel's Elbit Systems to provide J-Music electronic countermeasures systems to the fleet. On 22 December 2017, Belgium signed a contract for one A330 MRTT, to be based at Eindhoven Airbase, bringing the total MMF fleet to 8 aircraft. and officially joined the program on 14 February 2018. Out of the total of 8 aircraft currently on order, 5 will be based at Eindhoven AirBase (MOB) and 3 at Koln-Bonn Airbase (FOB). The Czech Republic is reportedly considering joining the Multinational Multi-Role Tanker Transport Fleet program. In January 2018, Indonesian Air Force officials were reported as saying they were studying both the Airbus A330 MRTT and Boeing KC-46 Pegasus aerial refuelling aircraft for a future modernisation programme, expected to take place after the current Airbus A400M Atlas programme completes. The Indonesian Air Force is said to compare the aircraft on compatibility with the force's current aircraft, life-cycle costs, interoperability with current and future assets, and potential funding and technology transfer options with state-owned aircraft manufacturer Indonesian Aerospace. The Airbus 330 MRTT and Il-78 were competing for a global tender floated in 2006 by the Indian defence ministry for six refuellers to extend the operating radius of Indian fighter jets. In May 2009, India finally chose the Airbus A330 MRTT over the Il-78. However, in January 2010, the government cancelled the order citing high cost as the reason, reportedly against the wishes of the Air Force. After rebidding, India selected Airbus as its "preferred vendor" in November 2012. In January 2013, it was reported that India had again selected Airbus' A330MRTT as "preferred bid". Airbus Defence and Space (DS) has said India's Ministry of Defence (MoD) terminated in late June the six-year-old US$2 billion tender for six multi-role tanker transport (MRTT) aircraft for the Indian Air Force (IAF), for which the company's A330 MRTT had been shortlisted. An Airbus official stated "We have been notified by the MoD of the withdrawal of the request for proposals (RfP), but we do not see this as the end of the road for the A330 MRTT campaign in India", and added that the aerospace company "will engage with the Indian government in finding a way to bring the A330 MRTT's capabilities to the IAF." In January 2018 the Indian Air Force re-launched its air-to-air refueling procurement programme, and sent out a request for information to Airbus, Boeing and Ilyushin, to which Airbus could respond with an offer for the A330 MRTT. Both Airbus and Boeing responded to the request for information, but Ilyushin was disqualified as the official requirement is for an aircraft with two turbofan engines. India is also considering purchasing airborne early warning and control (AEW&C) ("AWACS") aircraft that can also perform aerial refuelling. On 27 March 2014, Airbus announced that the Qatar Emiri Air Force intends to purchase two A330 MRTTs. Spain's Ministry of Defence stated that it is to acquire two A330 MRTT in 2016 to replace its ageing Boeing 707 tankers. In 2014, Spain's Secretary of State for Defence, stated that the Ministry of Defence began negotiations with Airbus Defence and Space about swapping their excess order for 13 Airbus A400Ms for an undisclosed number of Airbus A330 MRTT aircraft. Airbus Defence and Space commercial director said that although being a difficult issue, the company will cooperate with Spain in order to find possible solutions to reach an agreement. As of September 2018, Spain is still considering the option but has yet to make a decision. Sweden is reportedly considering joining the Multinational Multi-Role Tanker Transport Fleet program. The A330-based tankers lost in a bid for the Brazilian Air Force KC-X2 Program. Instead IAI won the contract for two 767-300ER tanker conversions. The US Air Force (USAF) ran a procurement program to replace around 100 of their oldest KC-135E Stratotankers, i.e., initially excluding the more common updated KC-135R variant. EADS offered the A330 MRTT. The Boeing KC-767 was selected in 2002; however the USAF cancelled the KC-767 order upon the uncovering of illegal manipulation and corrupt practices during the competition. In 2006, the USAF released a new request for proposal (RFP) for a tanker aircraft, which was updated in January 2007, to the KC-X RFP, one of three acquisition programs that are intended to replace the entire KC-135 fleet. The Airbus A330 MRTT was proposed again by EADS and Northrop Grumman as the KC-30. It again competed against the Boeing KC-767, which is a smaller aircraft (holds about 20 percent less fuel), less cargo, but is also cheaper. Northrop Grumman and EADS announced plans to assemble the aircraft at a new facility in Mobile, Alabama, which would also build A330 freighters. The Air Force announced on 29 February 2008, that the KC-30 was chosen as the KC-135 replacement, and was designated KC-45A. On 18 June 2008, the United States Government Accountability Office (GAO) upheld a protest by Boeing on the award of the contract to Northrop Grumman and EADS due to contract process improprieties. This left the status of the KC-45A in doubt, because the GAO decision required the US Air Force to rebid the contract. On 24 September 2009, the USAF began the first steps in the new round of bids, with a clearer set of criteria. On 8 March 2010, Northrop Grumman withdrew from the bidding process, asserting that the new criteria were skewed in favour of Boeing's offering. On 20 April 2010, EADS announced it was re-entering the competition on a stand-alone basis and intended to enter a bid with the KC-45, still intending for Mobile to be the final assembly site. On 24 February 2011, the USAF announced that the development contract had been awarded to Boeing. William J. Lynn III, the deputy defence secretary, said Boeing was "the clear winner" under a formula that considered the bid prices, how well each of the planes met war-fighting needs and what it would cost to operate them over 40 years. An Airbus A330-200 converted by Airbus Military for air-refuelling duties. Australian designation for an A330 MRTT with two under-wing refuelling pods and an Aerial Refuelling Boom System. United States Air Force designation for an A330 MRTT with two under-wing refuelling pods and an Aerial Refuelling Boom System, order cancelled. Royal Air Force designation for an A330 MRTT with two Cobham 905 under-wing pods, primarily used for refuelling fast jets. Royal Air Force designation for an A330 MRTT with two under-wing pods and a "Cobham Fuselage Refuelling Unit (FRU)" for a centreline refuelling capability, primarily used for refuelling large aircraft. Map with Airbus A330 MRTT operators in blue, note that Multinational Multi-Role Tanker Transport Fleet (MMF) operators are also included. Belgian Air Force – 1 aircraft on order, to be owned by NATO as part of the Multinational Multi-Role Tanker Transport Fleet (MMF). Luftwaffe – 4 aircraft on order, to be owned by NATO as part of the Multinational Multi-Role Tanker Transport Fleet (MMF). Royal Netherlands Air Force – 2 aircraft on order, to be owned by NATO as part of the Multinational Multi-Role Tanker Transport Fleet (MMF). Royal Norwegian Air Force – 1 aircraft on order, to be owned by NATO as part of the Multinational Multi-Role Tanker Transport Fleet (MMF). Royal Saudi Air Force – 6 delivered. United Arab Emirates Air Force – 3 delivered. Royal Air Force – 14 delivered (7 × KC2, 5 × KC3 + 2 fitted for KC3). Aircraft owned by AirTanker who operate or wet-lease out aircraft not required by RAF tasking. On 19 January 2011, an air refuelling accident occurred between a boom equipped A330 MRTT and a Portuguese Air Force F-16 over the Atlantic Ocean off the coast of Portugal. Early reports indicate that the boom broke off at the aft end of the boom near the F-16's receptacle which caused the boom to recoil into the underside of the A330 MRTT. The boom then became uncontrollable and oscillated until it broke off the boom assembly at the pivot point. Both aircraft were damaged, but landed safely. The A330 MRTT involved was an Airbus test aircraft destined for the RAAF; the air arm issued a statement that the aircraft was operated by an Airbus crew with no Australian personnel on board. At the time of the incident, Airbus had not begun deliveries. On 10 September 2012 at approximately 19:30 (CEST), an A330 MRTT's refuelling boom became detached in flight at an altitude of 27,000 ft in Spanish airspace. The boom separated cleanly at a mechanical joint and fell to the ground, while the aircraft landed safely in Getafe. There were no injuries caused by the malfunction. The incident was the result of a conflict between the backup boom hoist (fitted to the UAE-destined A330 MRTTs) and the primary boom retraction mechanism, and was attributable to the testing being conducted. Airbus later explained that the malfunction was not possible under ordinary operating conditions, and that procedures had been designed to avoid similar incidents in the future. Following the incident, INTA, the Spanish regulatory authority, issued precautionary restrictions to other users of boom-equipped A330s. ^ "A330 MRTT Orders & deliveries". Airbus S.A.S. 14 December 2018. Retrieved 14 December 2018. ^ "A330 MRTT: The Benchmark" (PDF). ^ "A330 tanker gains military certification". 6 October 2010. Archived from the original on 7 October 2010. Retrieved 7 October 2010. ^ "First RAAF KC-30 arrives". Australian Aviation. 1 June 2011. Retrieved 27 June 2011. ^ "Qantas receives second A330 for Australia's KC-30 tanker conversion". Flight International, 25 June 2009. ^ a b "AIRBUS MILITARY DELIVERS FINAL A330 MRTT TO ROYAL AUSTRALIAN AIR FORCE". Asia-Pacific Defense Reporter. 11 December 2012. Archived from the original on 11 March 2016. Retrieved 4 January 2013. ^ "First new standard A330 MRTT makes maiden flight". airbusdefenceandspace.com. Archived from the original on 13 October 2016. 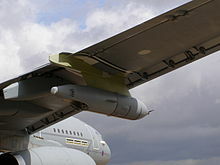 ^ "UK MoD: Other bidders didn't have a chance against Boeing Wedgetail". Defense News. Sightline Media Group. 2018-11-15. ^ Hoyle, Craig (29 June 2011). "PICTURES: Australia gets second KC-30A tanker". Flight International. Retrieved 22 May 2012. The General Electric CF6-80E-powered fleet will be flown by the service's 33 Sqn. ^ "KC-30A Multi Role Tanker Transport". ^ "New tankers to take on many roles". Air Force News (Australia). 24 February 2005. Archived from the original on 14 May 2011. Retrieved 26 May 2011. ^ "Second KC-30A touches down in Australia". Australian Aviation. 23 June 2011. Retrieved 27 June 2011. ^ "Fourth A330 arrives at BNE for RAAF MRTT conversion". Qantas Defence Services, 21 June 2010. ^ "Airbus Tanker Jet's Fuel-Boom Bug Confounds Australian Air Force". Bloomberg. 25 July 2013. ^ McPhedran, Ian (19 August 2013). "PM's Afghanistan visit cost total of $810,000". News.com.au. News Limited Network. Archived from the original on 23 September 2013. Retrieved 13 October 2013. ^ "Prime Minister Tony Abbott to fly worldwide non-stop on Airbus KC-30A". news.com.au. 14 August 2014. Retrieved 14 August 2014. ^ "RAAF to acquire two additional KC-30s". Australian Aviation. 1 July 2015. Archived from the original on 7 March 2016. ^ Waldron, Greg (1 July 2015). "RAAF orders two additional KC-30A tankers". Flight Global. Reed Business Information Limited. Retrieved 2 July 2015. ^ "Two ex-Qantas A330-200s to be converted to KC-30 tanker transports for RAAF". The Aviation Association of WA Inc. 1 July 2015. ^ Remeikis, Amy (8 October 2016). "Come fly with me - Australia gets its Air Force One". The Canberra Times. Retrieved 8 October 2016. ^ Nutbrown, Robert (14 October 2017). "RAAF KC-30 tanker to be modified for VIP transport". Australian Aviation. Retrieved 5 August 2017. ^ Nicholson, Brendan (4 October 2014). "Tony Abbott gives green light to RAAF airstrikes in Iraq". The Australian. News Corp Australia. ^ 2016 Defence White Paper (PDF). Australia: Commonwealth of Australia. 2016. p. 94. ISBN 978-0-9941680-5-4. Archived from the original (PDF) on 3 April 2016. ^ "EADS wins £13bn RAF tanker deal". BBC News. 27 March 2008. Retrieved 1 January 2010. ^ "RAF's largest ever aircraft arrives in the UK". 18 April 2011. Retrieved 19 April 2011. ^ "Programme Future Brize" (PDF). Global Gateway (RAF Brize Norton magazine). February 2011. p. 22. Retrieved 27 June 2011. ^ "United Kingdom Civil Aviation Authority Aircraft Register – G-VYGA". Caa.co.uk. Retrieved 12 February 2014. ^ a b "ZZ338 arrival completes the RAF Voyager core fleet". Airtanker. Retrieved 2 June 2014. ^ "RAF advances AAR capability (video) – News – Shephard". shephardmedia.com. ^ a b "The Voyager family is complete at RAF Brize Norton". Royal Air Force. 14 July 2016. Retrieved 14 July 2016. ^ "PM to get own plane for official trips – News – BBC". ^ "RAF's VIP Voyager Enters Service". Forces TV. 7 July 2016. Retrieved 15 July 2016. ^ Jennings, Gareth (4 April 2016). "UK RAF shows interest in Voyager boom". IHS Jane's 360. Retrieved 19 October 2016. ^ "UAE to buy 3 Airbus refuelling aircraft". Khaleej Times Online. Abu Dhabi: Khaleej Times. 20 February 2007. Archived from the original on 6 May 2009. Retrieved 2 April 2009. The United Arab Emirates Air Force will buy three military Airbus A330 refuelling aircraft rather than rival Boeing's 767 plane, a UAE military spokesman said yesterday. ^ "United Arab Emirates orders the A330 MRTT air to air refuelling aircraft from EADS". EADS website. Madrid: EADS N.V. 25 February 2008. Archived from the original on 21 February 2013. Retrieved 2 April 2009. United Arab Emirates has announced today the purchase from EADS, through its Military Transport Aircraft Division, of the A330 MRTT (Multi Role Transport Tanker) as the new air-to-air refuelling aircraft for the UAE Air Force & Air Defense. ^ a b c d e f g h Hoyle, Craig (19 October 2012), "Airbus Military explains cause of A330 boom detachment", Flightglobal.com website, London, England, U.K.: Reed Elsevier, OCLC 173992746, archived from the original on 22 October 2012, retrieved 22 October 2012, A back-up boom hoist intended to allow the structure to be retracted in the event of a failure to its primary system was being used, but its effects were unexpectedly countered by the main system until a failure and separation occurred. ^ "Airbus Military completes A330 tanker deliveries to UAE". Flightglobal. 6 August 2013. Retrieved 6 August 2013. ^ Hoyle, Craig (3 January 2008). "Saudi Arabia picks EADS to supply three Airbus A330-based tankers". Flightglobal. Reed Business Information. Retrieved 2 April 2009. Riyadh's selection of the Airbus A330-based multirole tanker transport was confirmed on 3 January, with the aircraft to be equipped with under-wing hose and drogue pods and EADS Casa's advanced refuelling boom system. ^ "Saudi MODA places order for EADS A330 Multi Role Tanker Transport (MRTT) for the future air-to-air refuelling aircraft of the Royal Saudi Air Force". EADS website. Madrid: EADS N.V. 3 January 2008. Archived from the original on 21 January 2013. Retrieved 2 April 2009. The Saudi MODA has decided the acquisition of the A330 MRTT as the new air-to-air refuelling aircraft for its Royal Saudi Air Force as a result of the competition process started in early 2006. ^ Tran, Pierre. "Saudi Arabia Buys 3 A330s From France"[permanent dead link]. Defense News, 27 July 2009. ^ "Airbus 330 MRTT". Airbus. Archived from the original on 30 March 2012. Retrieved 17 January 2012. ^ "Singapore Seeks Tankers, Tranports, ASW". Rpdefense.over-blog.com. Retrieved 12 February 2014. ^ "Singapore selects Airbus Defence and Space A330 MRTT Multi Role Tanker Transport". Airbus. 7 March 2014. Archived from the original on 22 January 2018. Retrieved 22 January 2018. ^ Waldron, Greg (6 March 2014). "Singapore confirms A330 MRTT buy". Flight Global. Singapore. Archived from the original on 1 July 2015. Retrieved 22 January 2018. ^ "Fact Sheet: Airbus A330 Multi-Role Tanker Transport". Singapore Ministry of Defence. 4 March 2014. Archived from the original on 22 January 2018. Retrieved 22 January 2018. ^ "Prime Minister Lee Hsien Loong Officiates the Republic of Singapore Air Force's Golden Jubilee Parade" (Press release). Ministry of Defence of Singapore. 1 September 2018. Retrieved 1 September 2018. ^ Drew, James (30 June 2015). "Airbus beats Boeing in South Korean tanker competition". Flight Global. Reed Business Information Limited. Retrieved 2 July 2015. ^ "First South Korean A330-MRTT". Airbus.com. 13 November 2018. Retrieved 14 December 2018. ^ Republic of Korea's First MRTT Arrives in Country. Aviation International News. 14 November 2018. ^ RoKAF first A330 MRTT landed in South Korea. Air Recognition. 12 November 2018. ^ Jennings, Gareth (30 January 2019). "South Korea receives first A330 MRTT aircraft". Jane's 360. London. Archived from the original on 30 January 2019. Retrieved 2 February 2019. ^ Dominguez, Gabriel (29 March 2019). "South Korea receives second A330 MRTT aircraft". Jane's 360. London. Archived from the original on 29 March 2019. Retrieved 31 March 2019. ^ "AFP: France to buy Airbus tankers from 2013". Google.com. 19 November 2011. Retrieved 12 February 2014. ^ "Projet de loi de finances pour 2013 : Défense : équipement des forces" (in French). Senate of France. 22 November 2012. Retrieved 7 November 2013. ^ Hoyle, Craig. "Airbus Military to table A330 tanker bids to France, Singapore". Flight International, 29 May 2013. ^ "French AF To Take 2 MRTT Versions". Defensenews.com. 21 February 2014. Retrieved 24 February 2014. ^ "France announces order for Airbus A330 MRTT air-to-air refuelling aircraft". Airbus Defence and Space. 20 November 2014. Retrieved 25 December 2014. ^ "France orders eight Airbus A330 MRTTs". Flight Global. 15 December 2015. Retrieved 29 July 2016. ^ Tran, Pierre (21 September 2018). "France wants to buy Airbus tankers sooner". DefenseNews. Paris. Archived from the original on 23 September 2018. Retrieved 23 September 2018. ^ "Accélération de la livraison des MRTT Phénix". Direction générale de l'armement. 21 September 2018. Retrieved 23 September 2018. ^ Jennings, Gareth (28 September 2018). "France receives first Phénix tanker-transport aircraft". IHS Jane's 360. London. Archived from the original on 6 October 2018. Retrieved 6 October 2018. ^ "France orders three more A330 MRTT tankers". Airbus.com. Retrieved 14 December 2018. ^ a b c d e "MMF Background Paper - Flashback: From acknowledging Europe's Air-to-Air Refuelling gap to today's MFF signing" (PDF). Airbus Defence & Space. July 2016. Archived from the original (PDF) on 17 July 2017. Retrieved 17 July 2017. ^ "Airbus A330 MRTT kandidaat om KDC-10's te vervangen". Luchtvaartnieuws. The Hague. 19 December 2014. Archived from the original on 17 July 2017. Retrieved 17 July 2017. ^ "Defensie wil 840 miljoen euro voor drie vliegende tankstations". Tijd.be. ^ "Belgian Defense Ministry intends to buy 3 Airbus A330 MRTT aircraft". Air Recognition. Retrieved: 23 April 2015. ^ "More nations intend to join the MFF". OCCAR. 19 February 2017. Archived from the original on 7 November 2017. Retrieved 5 November 2017. ^ "Belgium to invest in multi-role tanker plane". 22 December 2017. ^ a b Chuter, Andrew (28 July 2016). "Netherlands, Luxembourg Pitch In Two Airbus Tankers For NATO Fleet". Defense News. London. Archived from the original on 12 October 2016. Retrieved 17 July 2017. ^ a b "Netherlands and Luxembourg buy tanker aircraft together". Netherlands Ministry of Defence. 28 July 2017. Archived from the original on 17 July 2017. Retrieved 17 July 2017. ^ "Germany and Norway formally join Netherlands and Luxembourg to operate pooled fleet of NATO-owned Airbus A330 MRTT tankers (MMF)". OCCAR. Bonn, Germany. 29 June 2017. Archived from the original on 17 July 2017. Retrieved 17 July 2017. ^ "More nations join pooled MRTT fleet". NATO Support and Procurement Agency. Luxembourg. 29 June 2017. Archived from the original on 17 July 2017. Retrieved 17 July 2017. ^ Allison, George (30 June 2017). "Germany, Norway join Netherlands and Luxembourg to operate pooled fleet of NATO tankers". UK Defence Journal. Archived from the original on 17 July 2017. Retrieved 17 July 2017. ^ "Germany, Norway sign for five A330 tankers". FlightGlobal. 26 September 2017. Retrieved 28 September 2017. ^ Egozi, Arie (20 December 2017). "J-Music to protect NATO tanker fleet". Flight Global. Tel Aviv. Archived from the original on 28 December 2017. Retrieved 28 December 2017. ^ Tomkins, Richard (19 December 2017). "NATO orders Elbit infrared counter-measures system". United Press International. Archived from the original on 28 December 2017. Retrieved 28 December 2017. ^ "Elbit Systems Awarded Follow-on $46 Million Contract to Provide DIRCM Systems to NATO". Elbit Systems. Haifa. 19 December 2017. Archived from the original on 28 December 2017. Retrieved 28 December 2017. ^ a b Bartunek, Robert-Jan; Blenkinsop, Philip (22 December 2017). "Belgium to invest in multi-role tanker plane". Reuters. Brussels. Archived from the original on 28 December 2017. Retrieved 28 December 2017. ^ a b Osborne, Tony (26 December 2017). "Belgium Signs Off European Tanker Fleet Entry". Aviation Week. Archived from the original on 28 December 2017. Retrieved 28 December 2017. ^ Fiorenza, Nicholas (15 February 2018). "Belgium joins multinational MRTT programme". IHS Jane's 360. London. Archived from the original on 17 February 2018. Retrieved 17 February 2018. ^ "Belgium formally joins the MMF program". Air Recognition. 14 February 2018. Archived from the original on 14 February 2018. Retrieved 17 February 2018. ^ a b c Tigner, Brooks (13 September 2018). "Europe urged to provide more aerial refuelling capacity". IHS Jane's 360. Brussels. Archived from the original on 13 September 2018. Retrieved 16 September 2018. ^ Rahmat, Ridzwan (18 January 2018). "Indonesia puts KC-46A Pegasus, Airbus A330 in frame for aerial tanker requirement". IHS Jane's 360. Singapore. Archived from the original on 19 January 2018. Retrieved 19 January 2018. ^ "Airbus wins an order from India for its airborne refuelling tanker jet". The Daily Post. 26 May 2009. Archived from the original on 29 February 2012. Retrieved 3 August 2009. ^ "IAF's Rs 6000-cr refuelling aircraft tender cancelled". ^ Mathews, Neelam. "Cancellation Of Indian Midair Refuelers Concerns Industry" (subscription article). Aviation Week, 12 January 2010. ^ "Airbus Wins India's Tanker Rebid". Defensenews.com. Retrieved 12 February 2014. ^ "India selects Airbus Military MRTT for six-aircraft deal". Flight Global. 7 January 2013. Retrieved 12 February 2014. ^ "Indian defence ministry scraps MRTT tender for second time". IHS Jane's 360. Retrieved 29 July 2016. ^ Raghuvanshi, Vivek (26 January 2018). "Third time's the charm? India again attempts to buy midair refuelers". Defense News. New Delhi. Archived from the original on 27 January 2018. Retrieved 27 January 2018. ^ Joshi, Saurabh (15 February 2018). "Boeing KC-46, Airbus A330 MRTT in IAF tanker contest". StratPost. New Delhi. Archived from the original on 17 February 2018. Retrieved 17 February 2018. ^ "Next-Gen A-330 AWACS to have mid-air refuelling capability". The Economic Times. 2017-11-30. Archived from the original on 2018-03-05. ^ "Qatar selects Airbus A330 MRTT Multi Role Tanker Transport 27/3/2014". Airbus Military. Retrieved 27 March 2014. ^ Ediciones El País. "Un Airbus 330 cisterna será el 'tercer avión del Príncipe'". EL PAÍS. ^ Infodefensa (6 October 2014). "Defensa busca cambiar A400M por aviones de reabastecimiento MRTT" (in Spanish). Retrieved 8 October 2014. ^ "Antonio Rodríguez Barberán, director comercial de Military Aircraft: "La propuesta del Ministerio de cambiar A400M por A330 MRTT es un tema complejo pero lo estudiaremos"". Infodefensa. 20 October 2014. Retrieved 21 October 2014. ^ "Israel Aerospace Industries to work in Brazilian tank program". UPI.com. Retrieved 12 February 2014. ^ Cook, Dan (1 May 2002). "Boeing Given Nod on Tanker Lease". Military Aerospace Technology. Vol. 1 no. 2. Archived from the original on 28 September 2007. Retrieved 12 April 2007. ^ Cahlink, George (1 October 2004). "Ex-Pentagon procurement executive gets jail time". Government Executive. ^ Galloway, Joseph L. (28 March 2004). "Air Force Allowed Boeing to Rewrite Terms of Tanker Contract, Documents Show". commondreams.org. Archived from the original on 5 April 2004. ^ Holmes, Stanley (15 December 2003). "Boeing: What Really Happened". Business Week. Archived from the original on 27 June 2012. ^ "Air Force Posts KC-X Request for Proposals". Release Number: 070107. United States Air Force. 30 January 2007. Archived from the original on 15 February 2007. ^ Stewart M. Powel (29 February 2008). "At Boeing, shock – and then anger". Seattlepi.com. Retrieved 12 February 2014. ^ Butler, Amy, Fulghum, Davis A and Wall, Robert. "Northrop/EADS Clinches U.S. Refueler Deal". Aviation Week, 29 February 2008. ^ "Statement Regarding the Bid Protest Decision Resolving the Aerial refuelling Tanker Protest by the Boeing Company" (PDF). Government Accountability Office. 18 June 2008. Archived from the original (PDF) on 25 June 2008. Retrieved 18 June 2008. ^ "GAO backs Boeing tanker protest". KING-TV. 18 June 2008. Archived from the original on 29 December 2008. Retrieved 18 June 2008. ^ Cole, August (25 September 2009). "Air Force Resumes Tanker Contest". Online.wsj.com. Retrieved 12 February 2014. ^ "Statement From Northrop Grumman on U.S. Air Force Aerial refuelling Tanker Program". Northrop Grumman press release, 8 March 2010. ^ "Northrop Grumman declines to bid on latest KC-X RFP". Flightglobal.com. Retrieved 12 February 2014. ^ "Northrop and EADS to Drop Bid for Tanker". The New York Times. 9 March 2010. Retrieved 29 July 2016. ^ Drew, Christopher (24 February 2011). "Boeing Wins Contract to Build Air Force Tankers". New York Times. Archived from the original on 15 June 2013. ^ McLaughlin, Andrew (18 September 2017). "Sixth RAAF KC-30A arrives at Amberley". Australian Aviation. Retrieved 18 September 2017. ^ "La France prévoit de consacrer 295 milliards d'euros à sa défense entre 2019 et 2025". europe1.fr. Retrieved 17 March 2018. ^ a b "Germany and Norway place firm order for fleet of five NATO-owned Airbus A330 MRTT tankers". Airbus. ^ a b c "Orders, Deliveries, In Operation Military aircraft by Country - Worldwide" (PDF). 2016. Archived from the original (PDF) on 11 November 2016. Retrieved 10 November 2016. ^ Carlson, Steve (13 November 2018). "Airbus delivers first A330 tanker aircraft to South Korea". UPI. ^ "AirTanker and Thomas Cook Airlines agree landmark civil leasing deal". www.airtanker.co.uk. Retrieved 2016-12-24. ^ 10 Squadron Royal Air Force, accessed June 2013. ^ a b "Boom or bust! – RAAF KC-30 loses boom". Australianaviation.com.au. 20 January 2011. Retrieved 23 May 2011. ^ Hoyle, Craig (20 January 2011). "Airbus A330 tanker damaged in refuelling mishap". Flight International. Retrieved 23 May 2011. ^ a b c Butler, Amy (11 September 2012), "EADS Tanker Loses Boom Over Spain", Aviation Week website, New York, NY, U.S.A.: McGraw-Hill, ISSN 0005-2175, OCLC 779657086, archived from the original on 22 October 2012, retrieved 22 October 2012, No one on the ground or in the flight crew was injured. An Airbus Military spokesman says the boom separated cleanly at a mechanical joint, leaving minimal damage to the actual aircraft. ^ A330 MRTT page. Airbus Defence & Space. ^ "KC-30A Multi Role Tanker Transport". Royal Australian Air Force. Royal Australian Air Force. Retrieved 3 December 2015. Wikimedia Commons has media related to Airbus A330 MRTT.